Fernando Torres endured another torrid afternoon as 10-man Chelsea secured a comfortable 4-1 victory over Swansea. The Spain striker had given Chelsea the lead on 29 minutes but was shown a straight red card 10 minutes later for a rash challenge on Mark Gower. A goal in each half from Brazilian midfielder Ramires made the game safe for Chelsea. Defender Ashley Williams then scored a consolation for Swansea before Didier Drogba added a fourth in stoppage time. Chelsea made two changes to the side that lost at Manchester United, with Frank Lampard making way for John Obi Mikel and Nicolas Anelka starting ahead of Didier Drogba. Swansea named an unchanged side from their win over West Brom, and the visitors made an encouraging start, with Blues old boy Scott Sinclair prominent - Branislav Ivanovic had to make an important block to halt the winger's run. Raul Meireles volleyed over from 12 yards before Leon Britton blocked a close-range effort from Ramires as Chelsea started to press. Another Ramires effort was dealt with comfortably by Swansea's Dutch keeper Michel Vorm before Ivanovic's long-range effort flashed over the bar. The breakthrough came through Torres who, pilloried for his miss against Manchester United a week earlier, scored his second goal of the season. Juan Mata chipped a ball over the top and Angel Rangel played Torres onside, allowing him to swivel and find the bottom corner. Chelsea were turning on the style and seven minutes later doubled their advantage. Ashley Cole picked out the advancing Ramires on the edge of the area and he coolly slotted the ball through the legs of Vorm. Swansea chances were now few and far between, with Williams failing to get his head to Gower's free-kick. With the extra man, Swansea, who introduced Wayne Routledge for Britton at the interval, began the second half strongly. Meireles was forced to concede a corner before Nathan Dyer's rasping effort from the edge of the area deflected off Mikel and hit the crossbar with Petr Cech helpless. Mikel prevented Leroy Lita converting Rangel's cross before Jose Bosingwa was forced to clear Williams' header off the line from the resulting corner. At the other end, Vorm had to scramble to push away Cole's cross, which had been deflected off an oblivious Garry Monk. Anelka then almost scored a superb individual goal when his piledriver struck the bar and with 14 minutes remaining Ramires scored his second, cutting inside Williams before slotting past Vorm. Swansea claimed a consolation when Williams found himself unmarked in the box to head home Gower's free-kick - his side's first away goal in the Premier League. But it was Chelsea who had the last word, with substitute Drogba turning on Malouda's pass and steering the ball home. "With 10 men, we never lost our will to continue to attack and I think it paid off. It was an important win for us based on the last defeat at Old Trafford and showing resilience in the end again after Wednesday. "It really shows the nature and commitment of these players towards their objectives." 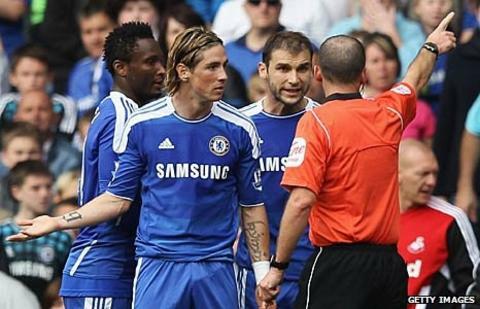 "I don't think Torres is a malicious player. It's one where the ball's just got away from Gower. "He probably feels it's there to be won and he's trying to show his intention at the moment that he's fighting for everything. "To be fair, the best team won, so I'm not going to sit here and say that we deserved to win the game."